﻿ Common Plantation Shutter Materials -… | The Great Shutter Co. This beautiful house is located on St. James’ Road in Southampton, Hampshire has the most gorgeous large windows. Be able to fully open the top half of their shutters independently from the bottom. On such large windows tier on tier wooden plantation shutters are a fabulous solution allowing the top tier to be folded back completely from the window, allowing all the light to flood through and providing unimpeded views out. Tier- on- tier window shutters are such a versatile solution because you get the best of both worlds – full privacy and complete light control when desired, and bi-folding the shutters back out of the window when you want to let the world in. Weight is however a consideration when considering and installing tier-on tier plantation shutters and here is a background to this consideration. What Material Is Best To Use for Tier-On Tier Shutters? So, in determining which material to install a tier on tier shutter in, the weight is an important factor. For shutters which are going to be hinged and frequently folded back out of the window space, it is much better to install a lightweight wooden shutter such as the hardwood product or the Wood/ MDF Hybrid product which has an MDF frame but a lightweight all wood shutter panel, so that the stress on both frame and hinge are minimised. MDF which is a cost effective and incredibly robust shutter is not ideally suited to a tier on tier installation as it is very heavy. MDF (medium density fibreboard) is a composite of wood which has been broken down into wood fibres and then is bound together with wax and resign under high temperature and pressure and is very dense. Wood on the other hand is about 40% lighter in weight and is a product, full of natural air pockets (which incidentally makes a wood shutter the best insulating window covering that there is, especially for Winter). 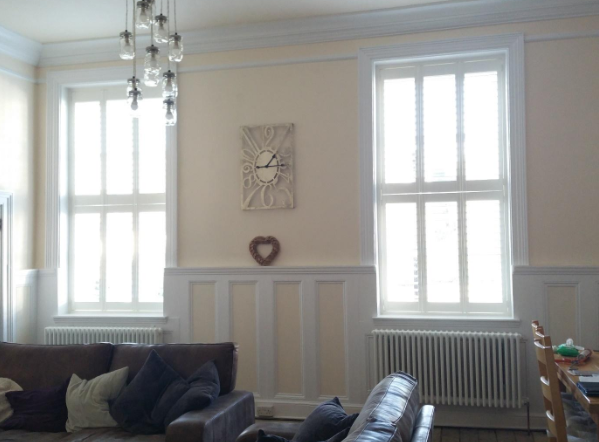 The client expressed a wish to install a more traditional style of shutter with centre tilt rods and 64mm louvres to complement the Victorian features of their home which they had perfectly preserved and you can see this on the photographs. 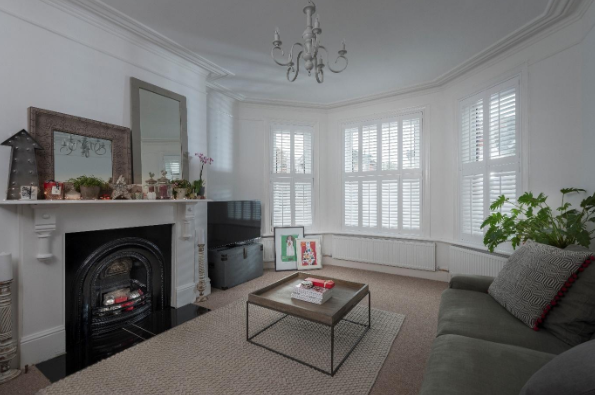 But the white wooden shutters not only suit the room’s traditional style perfectly, but at the same time they provide a traditional property with a very contemporary and practical solution. Have you got a brief for window shutters that you would like to discuss with our experts? At The Great Shutter Co. we will provide you with friendly impartial advice on all of the shutter configuration options available to you. Material - All wood, hybrid or MDF? We are impartial and not tied to a specific product as some retailers are, so we can advise you on what is best for you. Delighted customers are what counts as far as we are concerned, and our reviews on Feefo and Checkatrade verified this. Call The Great Shutter Co. on 02381 676 870 to consult on a no obligation basis about your needs and how we can create the perfect solution for you.